Back from vacations, and working on dungeon functionality when I am not slacking. A couple of bugs have been fixed which allowed entry to rooms not unlocked yet, and some which caused the UI to not be updated after fights. Also added a hint as to the difficulty of fights/stealth/etc for each encounter. Currently working on the different encounters and making them more varied and diverse. I’m off for a few days of vacation. I will be back tuesday. So I won’t be responding to any mail or other stuff until then. Hopefully I will be invigorated and ready to do tons of work on getting this closer to fully playable! Dungeon gameplay has been expanded. When you send a hero to a dungeon, you can now move the hero through the rooms, and choose various options for how to deal with encounters – fighting, stealthing past, ambushing from the shadows, parlay, etc.. There is still some usability stuff that I want to get done real soon, and some polishing on this feature, but it is very close to being fully functional and usable. At the moment you can move around, fight, sneak, ambush, etc. but will not be given any loot nor will getting wounded have much consequence. The last terrain type without graphics – Rocky Badlands – has graphics now, so now there are no more colored hexes. This should make the maps more easy to read and more pleasing to the eye. Work has been a bit slow lately due to a mix of summer distractions and some important personal stuff. I also managed to get ill, so all in all not as much time for this project as I would have liked. I hope to remedy this in the following weeks, and get regular updates up and features fleshed out. Once enough gameplay features are ready, I will make a play-through video which will also serve as a tutorial of sorts. Dungeons also have a bit more interesting names than just “Dungeon”. Here are a few examples from the last test-run: “Temple of Shadows”, “Ominous Descent of Wonder”, “Scarlet Labyrinth”, “Enigmatic Halls of The End Times”, “Temple of Fools” and the popular tourist destination of the “Doomed Tower of Calamity”. Here is a screenshot of the demon wizard Urxokol exploring the Temple of Shadows getting ready to fight some Crabmen Scavengers. There is some rocky badlands visible in the screenshot as well. Ancient civilizations are now generated for the world, with some history and hallmarks for use in events and ruins. 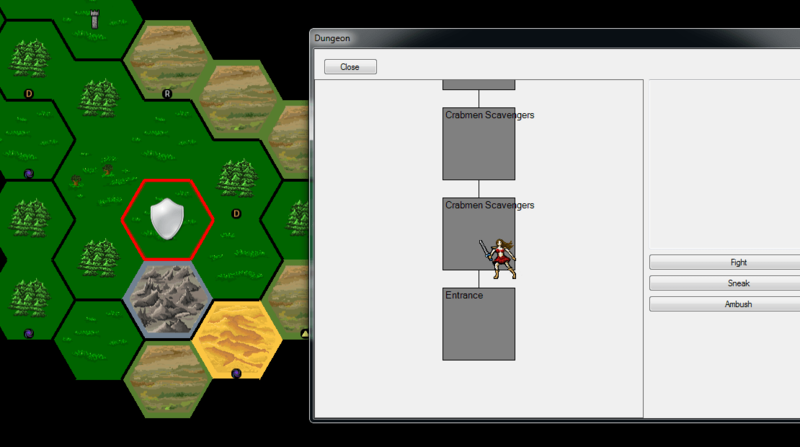 The interactive dungeon system is coming along, but not fully usable yet. Hopefully it will be in for next release. The procedural names have been improved, and graphics for magma fields added. Here is a screenshot of a test run. I really like Cotter Curlyfox the Spider, God of Love, Fire and Prosperity. Stuff like that is why I love procedural content so much.